“The report that First Officer Murdoch and not Captain Smith shot himself on the bridge just as the forward section of the Titanic sank is true. I still have before me the picture of Mr. Murdoch standing on the bridge as the waters surged up about him, placing the pistol to his head and disappearing as the shot that ended his life rang out." There are several Williams aboard Titanic, but no “Jack Williams”. It is possible that “Jack” is a nickname or a pseudonym to remain anonymous (like many White Star Line employees who wanted to protect their future careers). A “medium sized, stockily-built, blond-haired man of thirty-six” according to Sinking of Titanic: Eyewitness Accounts (p.151 (32.)) Also a passing mention in A Night to Remember: “Seaman Jack Williams and William French watched six men shot down like dogs… All the evidence went against such stories, but the public was too excited to care.” (p.147 (20.)) There is presently no information on location as yet. George Jacub provides a possible explanation: "There was a fireman named William John Murdoch. William John. Jack Williams. Surviving firemen would hang around together. But why use false names? Because shooting was still a sensitive topic... Williams was supposedly 36; William Murdoch was 34...Williams was quoted saying 'French and I stood by as the two emergency boats---those that are always kept ready for rescue purposes at sea---were made ready.'... 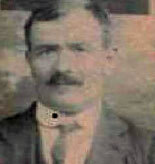 William John Murdoch said he helped lower Collapsible D from the davits of Boat 2, one of the emergency boats). (The Shootings on the Titanic by George Jacub) "
“When the first of the 56-foot lifeboats were being filled, the first stampede of panic-stricken men occurred… these men were dragged back and hurled sprawling across the deck… About ten shots sounded in quick succession. The six cowardly men were stopped in their tracks, staggered and collapsed one after another. At least two of them vainly attempted to creep toward the boats again. The others lay quite still. This scene of blood shed served its purpose. In that particular section of the deck there was no further attempt to violate the ‘women and children first’ rule…. In the semi-darkness and prevailing excitement faces left no distinct impression with me. I should say that most, if not all of them, were from steerage. Other men passengers who in a general way resembled these same men were among a score or so who jumped from the upper decks into the boats occupied by women and children, after the order had been given to lower the boats. These men were not shot. They were tossed by the officers and crew of the boat into the sea, where most of them perished, as they deserved to. Williams, by his account, gives evidence of both marginal accuracy and exaggeration, the later being the foremost. In reading his account elements of truth come through, such as the heroism of the firemen below, which, true to his words, has been given little credit. But one cannot help sense exaggeration when he speaks of “bloodshed”. It is true that at least two officers if not more fired their revolvers during the evacuation and that possibly an injury or even death could have taken place. But to speak of “bloodshed” smacks of sensationalism, unless provoked by an emotional over-reaction to the scope of the tragedy. To his credit, he dismisses the rumour that Captain Smith shot himself and since certain elements of truth are embedded into his exaggerated tale we can still not totally rule out his evidence. All images and quotations belong to the stated source and for research purposes only. No copyright infringement intended. Material can be removed upon request.